Grilled Chicken Breasts, Orange-Mustard Glaze, Thyme for Cooking. Mix Teriyaki sauce and mustard well with a whisk, add marmalade. Pour over chicken breasts and let marinate for 10 - 20 minutes or longer. 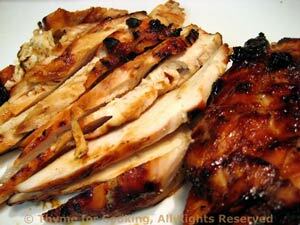 Either cook 10 - 15 minutes on barbecue grill or under broiler (4 inches ) for 6 - 8 minutes a side. They should be nicely browned and juices should run clear when pierced with a knife. They could also be baked for 30 minutes @350 F.